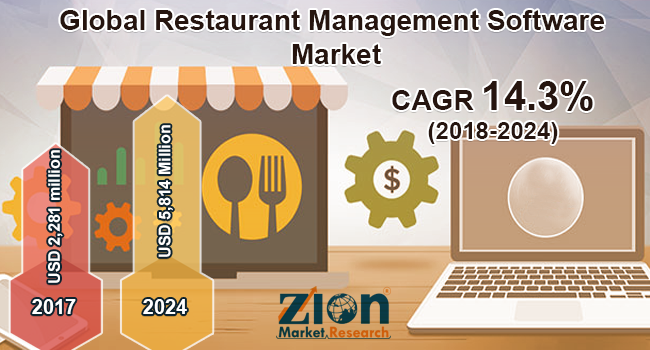 Zion Market Research has published a new report titled “Restaurant Management Software Market by Software (Table Management, Cashflow Management, Accounting, Employee Scheduling, Order Monitoring, Payroll Processing, Analytics, and Others), by Deployment (Cloud, On-Premise, and Hybrid), and by End-User (Full-Service Restaurants, Fast Food Restaurants, and Institutional): Global Industry Perspective, Comprehensive Analysis, and Forecast, 2017—2024”. According to the report, the global restaurant management software market accounted for USD 2,281 million in 2017 and is expected to reach USD 5,814 Million globally by 2024, at a CAGR of 14.3% between 2018 and 2024. Restaurant management software is designed for the foodservice industry, which helps the restaurant authorities to manage their businesses more effectively. It helps also the managers and hotel management to know the overall daily customer count and strategize accordingly. This software is used for various processes, such as billing, ordering, inventory management, and queue management. Increasing cashless payment is expected to boost the demand for restaurant management software in the market. More and more customers are opting for cashless payments. Thus, it has become a necessity for restaurants to have the cashless payment options for the customers. In the year 2016, about 38 million Americans used mobile payments for various purposes. The restaurant management software market is likely to boost in the forecast time period, owing to the increasing number of hotels and restaurants globally and substantially developing hospitality sector. Various restaurant management software startups are receiving funds for software development and expansion of the firms. In 2018, Toast raised funds worth USD 115 million. The restaurant management software market is segmented on the basis of software, deployment, and end-user. By software, the market is fragmented into table management, cashflow management, accounting, employee scheduling, order monitoring, payroll processing, analytics, and others. The analytics segment is anticipated to grow substantially over the forecast period as most restaurants are opting for solutions that offer insights about daily customers served, inventory, staff, etc. The deployment segment includes cloud, on-premises, and hybrid. By end-user, this market includes full-service restaurants, fast food restaurants, and institutional. Full-service restaurants are projected to hold a considerable share in the restaurant management software market in the future, due to the expansion of luxury hotels and restaurants across the world. By region, North America is anticipated to contribute substantially to the restaurant management software market globally in the future. This can be attributed to the increasing adoption of cashless payments by various restaurants and hotels s. The U.S. and Canada are projected to make significant contributions to the region’s restaurant management software market in the forecast timeframe. The Asia Pacific is likely to grow substantially in the global restaurant management software market over the estimated period, due to the rising technological adoption in the region’s developing countries, such as China and India. Some noticeable players of the restaurant management software market are HotSchedules, Clover Network, Inc., Fishbowl Inc., NCR Corporation, Revel Systems Inc., Toast, Inc., OpenTable, Inc., Jolt, Square Inc., Oracle Corporation, and Touch Bistro, among others.